We’ve all seen the large LCD screens used for advertisements, or at the bank displaying the current time and temperature. Well what would you do with a smaller version of this kind of screens built into your personal computer? The possibilities are endless. Matrix Orbital has come up with a new product line, the MX6 series, which consists of four different versions all of which utilize a PLED (Polymeric Light Emitting Diode) screen. 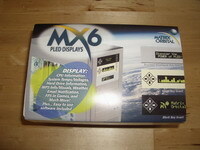 Matrix Orbital recently sent over the MX610 along with a few extra accessories for review. The Matrix Orbital MX610 arrived in a small package with listed features and information printed on it. The contents were tightly packed and no damage from shipping was apparent. 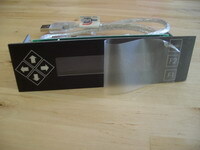 Included in this package along with the PLED display was the external USB cable, software and a quick installation guide. They also included a few optional pieces of hardware for sake of reviewing; these included the internal USB cable, two temperature probes, and an LED indicator. 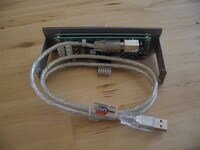 Shown below is the PLED with the included USB cable for external connection. 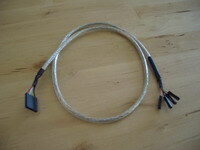 As you can see the cable is plenty long at three feet and is removable if the internal cable option is desired. 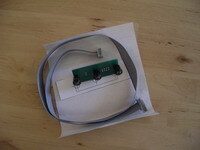 Also seen are the connections for the additional options such as fan controllers and temperature probes. 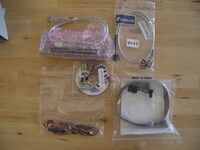 Up next are a few of the optional pieces of hardware that are not included in this kit. First is the internal USB cable which is not as long as the external cable but more than adequate for any computer case. On the right we see the temperature probes, again with more than enough wire to reach anywhere in the case and then some. This next option is the LED indicator. 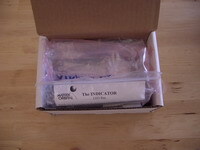 The indicator is a set of three LEDs that connects via cable to the PLED screen. 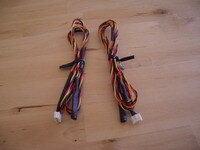 These can be used to notify the user of important events such as incoming email, high temperatures and low fan speeds.